Flexible working comes in all guises, it does not simply mean reduced working hours or employees working from home. Whether your work force is large or small, there are a number of ways you can use flexible working arrangements to avoid or reduce redundancies. If you do however plan to offer flexible hours to your staff there are certain legal proceedings that you will need to follow. Before you speak to employees about changing their working pattern or reducing their hours, it is good to have some kind of idea about what structure you want to put in place. You will need to first assess what you can afford to pay your workers and calculate how the work can be shared between them.Flexi working does not always mean cutting down on the number of hours employees work, but it can also provide a solution if your company needs to relocate to cut costs and not all of the staff can make the journey. Flexi time as it is referred to allows workers to choose when they want to work. 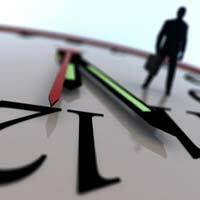 They will have a set number of hours a week in which they have to work and usually some core hours they must be in the office, for example between 11am and 3pm - it may then be possible for them to work their other hours from home. Another option to consider would be annualised hours, where staff still work their agreed hours but over fewer days. This may mean you can cut costs by closing the office one day a week and having staff extend their normal working hours on the other days. Job sharing is the ideal way to cut down on costs by allowing staff to share one role. Both parties will need to agree and give their consent for this, but if faced with the risk of redundancy or sharing their job, you may find many staff are happy to share. Depending on what kind of business you run a good way of cost cutting is allowing staff to work from home. If you can cut down on your office space and lighting and heating costs, this could free up some money to keep a member of staff on. Another option would be to cut down employees’ hours and switch them from full-time to part-time - saving you money in the process.Similarly, if you work for a company that is making redundancies and you feel flexible working is something they should consider there is nothing to stop you from suggesting an action plan to your employer – they may not accept it but at least you will have tried. It may make sense to revamp the working pattern of your staff but when it comes to changing their contract your hands will be tied by what you can legally do. You will not be able to change their working hours without their consent.The devil will be in the detail and you will need to check their contract to see if it stipulates what changes you can make to their employment. If you can, you should consult a solicitor about drawing up a new contract for your employees or altering their hours, as you could find they can claim for unfair dismissal if you are at fault and impose working hours on them that their contract does not allow.Your first step should be to ask the staff members in question if they accept the new working conditions and if so you should be ok to draw them up a new contract and have them sign it. If they do not agree to it and their contract does not specify that you can change the terms of their employment then you will unfortunately need to make them redundant. It is worth remembering that you will still be liable for the health and safety of your staff if they work from home. You should ideally carry out a health and safety assessment of their working area at home, or have it written into their contract that they must be compliant with health and safety policy themselves. You will also need to work out the practicalities of any flexible arrangement you come to. If the staff need access to machinery or special equipment in order to do their work this will have to be taken into consideration. You will also need a method of monitoring the staff to make sure they are doing the said hours. If you are looking into job sharing you will have to consider how that will work, what will each person be responsible for and are there any parts of the job that will need consistency. If an employee is doing their job and another person’s role for part of their working week you will need to work out how many hours they will do each role for. Introducing flexible working hours has helped many firms cut down on the number of people they make redundant but it is something that needs thorough planning and to be worked out properly before you start pitching the idea to staff. I have been made redundant after refusing to accept my own job at a cheaper rate of pay, fewer hours and less status - described as a restructuring.Is this acceptable reason for redundancy? I went though a consultation process last year and unfortunately, was told that I was being made redundant. I was never given a termination date, and 7 weeks after I was told that I was being made redundant, I was told that the redundancy had been lifted. Someone told me that I am still eligible to receive the redundancy pay - is that correct?